On February 29, 1960, noted wildlife illustrator Rex Brasher died. 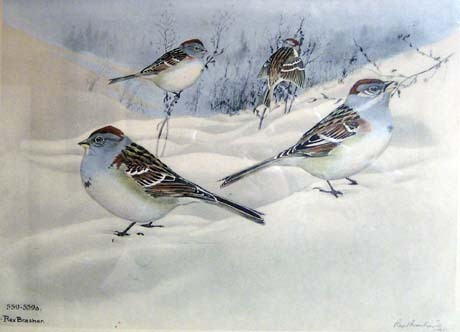 A prolific painter, based in Kent, Brasher produced 875 watercolors depicting 1,200 species and sub-species of North American birds. In fact, Brasher recorded more than twice as many birds as his better-known predecessor John James Audubon, who painted 489 species. Born in New York in 1869, Brasher began painting seriously in his teens. Inspired by his father at an even earlier age, Brasher had set the goal of painting all the species and sub-species identified in the American Ornithologists’ Union’s Check-list of North American Birds. Brasher strove for perfection, attempting to make his paintings as lifelike as possible by portraying birds in their natural habitats, illustrating gender differences, and recording their everyday activities. Visiting every state, Brasher captured birds that are now extinct, including the heath hen, passenger pigeon, and Eskimo curlew. He often financed these trips by working at odd jobs, including stints on fishing boats (this allowed him to work while also studying seabirds). He also funded his work through more unusual means, such as betting on the horses. Often unsatisfied with his results, Brasher twice destroyed all his paintings, an estimated 700 canvases. In 1911, after having received a $700 commission for illustrating a book, Brasher purchased a 150-acre farm in Kent, Connecticut, calling it Chickadee Valley. By 1924 Brasher had completed his series of paintings and attempted to have his work published, but the cost of printing all the plates in color was prohibitive. The persistent Brasher came up with a less costly solution. He hired the Meriden Gravure Company to produce black-and-white reproductions and then hand-colored the prints himself using an airbrush and stencil technique that he’d developed. This labor intensive process took four years to complete. The final book, Birds & Trees of North America, was produced in a limited edition of 100 sets of 12 volumes and included almost 90,000 hand-colored reproductions. The State of Connecticut purchased the Brasher collection in 1941 for $74,000, and though it has never been displayed in Connecticut in its entirety, the collection is preserved at the University of Connecticut’s Thomas J. Dodd Research Center.